GotToLove♥: Wish I Could Wear a Midi. I think that midi dresses look so sophisticated and I really want some! But I justdon't think I can wear them, and I'll tell you for why -little Gavin and Stacey quote there for you-... Anyway, the first reason I just don't think I could pull them off it because of my height. I feel like I go on about my height way too much, but it is a real inconvenience when it comes to clothing, dresses will be too long, skirts and tops as well. The main problem I have is with jeans, they are just so out of proportion with my legs, as they need to be wide at the thigh, go in at the knee and out again, so they are baggy in all the wrong places on me! And the second reason is that my boyfriend didn't like them, I know this shouldn't really matter but his opinion means so much to me -soppy-. Moving on from that, lets look at some dresses. Love love love this, most midi dresses that I see around are either strapless or have the regular thick straps. So I think that these wet look cap sleeve is just so awesome, and for only £14.99, probably the best midi ever! Get yours at Missguided. Again I like this dress as it's different to the standard one. The panelling against the lace insert looks so elegant, which I think looks lovely with the length of the dress. Also the high neck gives the illusion of a longer body, which for people my height is never is never a bad thing! -I'm 5ft2" by the way- You can get this stunning dress from Oasis at ASOS. This dress would be so perfect for work, sometimes a short dress just isn't acceptable but a maxi dress may be seen as too dressy or too slouchy depending on the style. But with this dress, you are showing an appropriate amount of leg without looking like you're trying too hard. 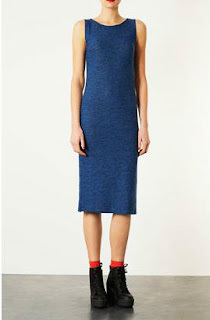 ASOS are doing a good job with midi dresses. I think that lace looks lovely in black, and especially being on a midi dress! The lace insert on the waist highlights the silhouette as a midi flat can make you look very flat if you have a slim figure. You can get this from Boohoo. I just love the casualness of this piece. The colour makes it look like it's completely denim which makes it even cooler! I always think the way that Topshop has styled is brilliant, I'm definitely going to invest in some chunky heeled boots too! I actually found it quite difficult to find midi dresses online, Primark has some very nice ones, but these have definitely been the best ones that I have seen!